Week 7 of Great British Menu had its final judging on Friday 25th May 2012. During the week chefs from Wales competed to impress veteran judge Angela Hartnett. Monica Shaw guest blogger at Great British Chefs watched the finals. 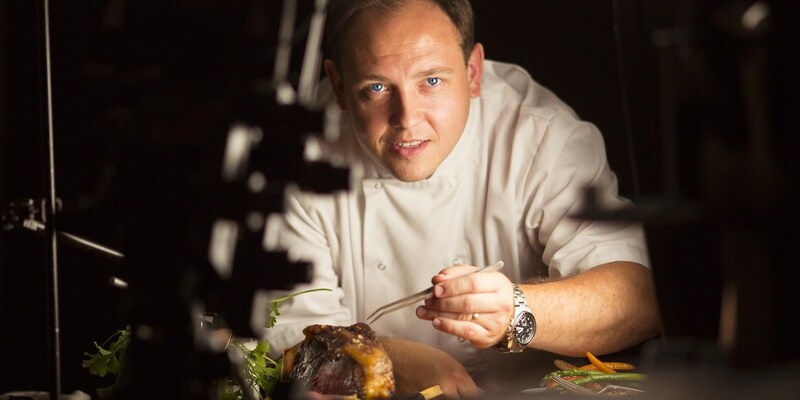 Which Welsh chef would be cooking at the Olympic banquet? 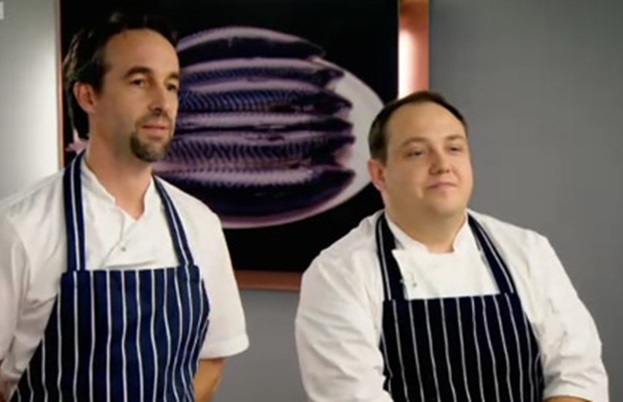 If ever there was a close match in Great British Menu it was the Wales heat. Thursday night saw Richard Davies lose out by just half a point, leaving James Sommerin and Stephen Terry to compete in the finals. Although their scores were close during the heats, the two chefs' cooking styles couldn't be any more different. 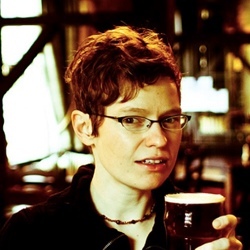 Whilst James takes a modern, molecular approach, Stephen sticks to more traditional techniques, admitting, "I focus on my strengths - my strengths are not doing rocket science." As usual, it was up to judges Prue Leith, Matthew Fort and Oliver Peyton to decide whose approach most reflected the talent and ambition of Olympic athletes. As in the heats, it was another close race. Stephen's approach was to create simple but beautifully prepared dishes presented in such a way as to reflect Olympic virtues, and with names to match. Such was the case with his starter, 'The Opening Ceremony', a warm pigeon salad with wild boar lardons, risotto cubes and caramelised hazelnuts. All of the judges agreed that the dish was good, but with reservations. "The quality of the pigeon is great, I love the dandelion," said Oliver, "it's a beautiful piece of cooking but not Olympic." Matthew Fort mockingly added, "Oh crikey, I've just remembered the brief - let's add caramelised hazelnuts!" James' starter of sage cream, onion, chicken & Welsh 'Brie' truffle toast faired slightly better. Although Prue thought the dish didn't "look very appetising", they all agreed that James had made an effort, but it needed work. "I feel like whipping myself for not liking this dish more," said Oliver, "this chef is making a go at being successful." 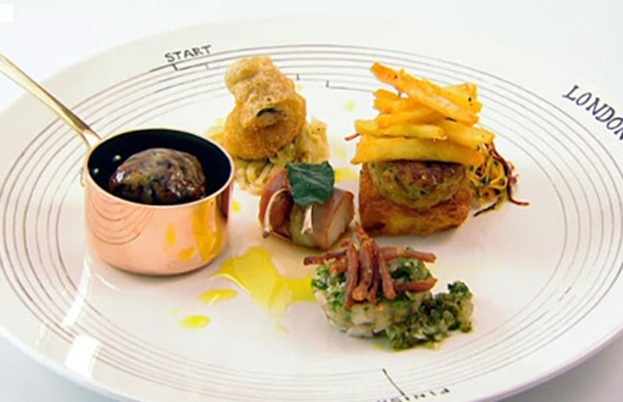 Stephen's fish dish, 'The Fish and Shellfish Medley', featured nine different types of fish and shellfish served in a series of five "rings" (you can guess what those represent). "Wowzer," said Matthew Fort. There was a lot going on here, but all of the judges seemed to like it, but with reservations. As Oliver put it: "It's not a world class gold winner." James' fish course - lobster with Iberico ham, spiced butter and broccoli - made an interesting first impression. "I've always wanted to eat food from a plate shaped like a bed pan," said Matthew. This dish caused much disagreement, with mixed opinions on the use of aubergine and broccoli, and Matthew being most unimpressed of all: "the day that mud wrestling becomes an Olympic sport, this dish can go through". Going into the main course, both chefs had a lot to prove. James was first with his Mangalitza pork, carrot, liquorice and leeks. The pork had the judges in "mmms" and "aahs" (though Oliver argued that there was too much fat on the dish). Delicious, but was it innovative? "Sadly not innovative enough," said Prue, "but I'd be happy to eat it at the banquet." Would Stephen's 'Bunny Pentathlon', consisting of five different preparations of rabbit, do any better? "Already I'm happier," said Oliver when the dish was served: "I love the journey of flavours throughout the palette". However Matthew argued that the dish was too much: "together it's a massive munching mouthful." For dessert, James' deconstructed raspberry and lemon cheesecake pleased the judges with its dry ice theatrics, and the flavour of the dish itself. "It's been creatively thought through," said Matthew, “I can see a whole lot of Olympians polishing that off and leaving dinner looking pretty damn chirpy." Stephen's 'Bronze, Silver or Gold?' - a trio of lemon meringue, chocolate mousse and trifle - ended things off on a high note for the judges, except Matthew who felt that the dish didn't fit the brief because the individual components were too basic. But this didn't bother Oliver and Prue, who called it "unpompous and simply delicious." Ultimately, it was Stephen's "simply delicious" cooking that led to his being chosen winner of the Wales finals, leaving a very disappointed James to pack up and go home. Congratulations, Stephen, who proved that you don't need to be a rocket scientist to win at Great British Menu - even simple dishes can pack an Olympic punch. Well done Stephen who go into the finals (joining Alan Murchison who won the Scottish round, Daniel Clifford who won the Central round, Colin McGurran who won the North East round, Chris Fearon who won the Northern Ireland round, Simon Rogan who won the North West round and Phil Howard who won the London & South East round). Next week is the last heat before the finals, with South West chefs Paul Ainsworth, Nathan Outlaw and Simon Hulstone competing who are all on Great British Chefs website.